The unique car you see in these photographs is a Woodill Wildfire, the 1950s brainchild of onetime Willys dealer B.R. Woodill. This design is the “series II” bodywork, which certainly hosts some strangeness in its proportions, but it’s not quite all the way to ugly. The fiberglass body plays on sports car themes of the era with thin hips and a wide nose. I see a bit of Jaguar XK120 in the design, a bit of contemporary Ferrari, as well as a lot of Kaiser Darrin. It makes sense that the Darrin and the Wildfire have some similarities, they were both designed in fiberglass with the help of Glasspar’s Bill Tritt. To prove the viability of fiberglass in automotive bodies, Tritt had developed two designs called Alembic I and Alembic II, which were later slightly reshaped for use as the Kaiser and the Wildfire, respectively. The real beauty hides underneath, however, with a tubeframe chassis built to accommodate a Detroit-built V8 engine. Only around 20 of these cars are said to still exist. Kit cars are known to improve as time passes, and because Woodill kits were sold from 1952 through 1956, this final-year model is likely to be one of the best-built examples. That’s not saying much for 1950s manufacturing techniques, however, because this car still looks a bit rough. There were a couple handfuls of Wildfires built by the ‘factory’, and according to Wiki a whopping 258 kits were sold nationwide. Kit cars were somewhat viable business back then. This particular example of the breed is available currently on BringATrailer with a surprisingly low bid tally. With 1960s Chrysler V8 power, this seems like it would be a lot of fun for very little cash outlay. 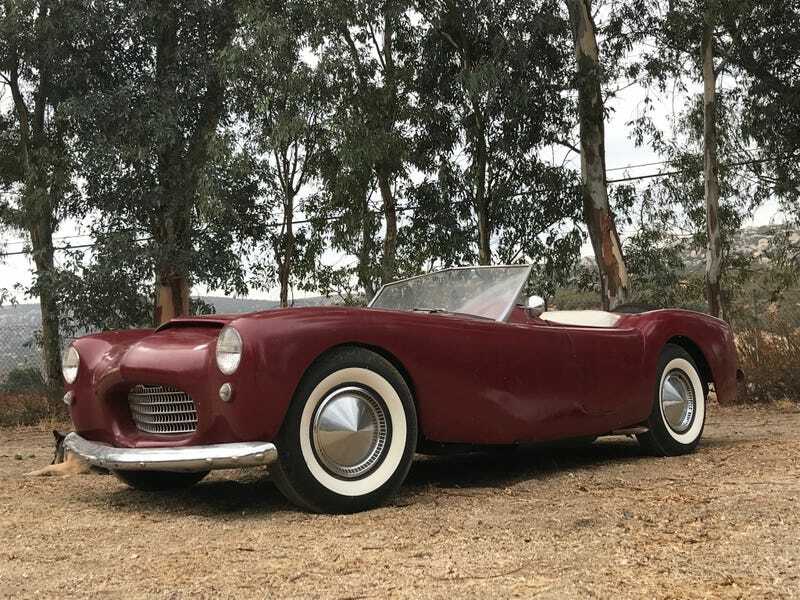 Sure, the continental kit looks ludicrous on this car, but think about the kind of fun cruising you could have in this weird fiberglass roadster. This video from the 1950s program “You Asked For It Presented By Skippy Peanut Butter” shows the complete construction of a Woodill Wildfire in just 4 hours (including a very interesting time-lapse segment). It’s a bit of a gimmick, but I’m willing to bet this actually sold a few kits for Mr. Woodill. What Do I Do With This Dumb $300 MG I Bought?